I loved the first two editions of Jessica Sprague's Computer Tricks for Scrapbooking (reviewed here and here), so when I heard she was doing a third volume, I knew it was a must-have. Computer Tricks for Scrapbooking 3 follows much the same format as the previous two versions which is wonderful because I always felt that she had a great variety of computer techniques for everyone from the beginner to expert. However, everyone can feel like a pro with Jessica's easy-to-follow step-by-step instructions. The book is divided into 5 sections and each one has at least one freebie to download and play with. There are 12 techniques featured in this section. A couple of my favorites: adding textures to photos and creating tall vertical photos with a clipping mask. There are 10 techniques featured in this section. There are 13 techniques featured in this section. There are 17 projects featured in this section ranging from calendars, framable art, mini calendars, home decor pieces, cards, recipe box and cards - even a custom onesie for your favorite new little one! Cool Sites for Scrapbookers - Includes information on some amazing online resources including 6 online tools to gather and share, 3 tools to design and play, 2 sites to get free stuff (fonts and brushes) as well as a list of Jessica's favorite digital shops. Digital Supplies for Every Scrapbooker - Includes a list of sites for digital supplies such as journaling brushes, swirl/floral brushes, fonts, dingbats, and frames. Organizing Your Digital Supplies - Includes information on free and low-cost options for organization of digital supplies. Jessica also covers her 3 steps to developing an organizational system. Hybrid Workflow - Includes the step-by-step process of uploading your photos from your camera to a finished hybrid scrapbook page. One of the main differences that I saw in this issue verses the previous editions was that the ALBUMS section seemed to be highly expanded. It might be titled 'albums', but the projects included really went well beyond just albums. There were really some amazing and creative projects included in this section that would be great not only to make for yourself, but also to give as gifts for a variety of occasions. I really hope to be able to give several of them a whirl. In addition to Jessica's amazing layout examples, there are also seven other very talented contributors including Joanna Bolick, Marcia Beltich, Susan Weinroth, Kelly Purkey, Ingunn Markiewicz, Candice Stringham, and Jennifer Pebbles. Jessica was kind enough to give me TWO copies of this book to give away. 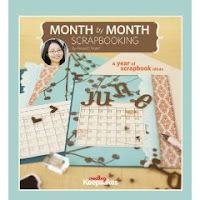 I gave one away in honor of National Scrapbooking Day, so that leaves me one more for one lucky reader. TELL ME: Why do you want this book? Leave your comment by Thursday, May 14th, 2009, 11:59 PM (CST) in order to be considered to win. I will announce and contact the random winner via email on Friday. 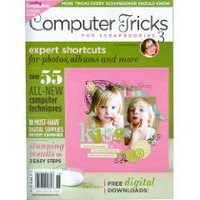 Visit the Computer Tricks for Scrapbooking 3 page at Amazon.com. You can also read more of my reviews for other recommendations.